Last week I mentioned a miracle I experience on my the plane from Spokane to Seattle before coming to Taiwan. So I was 2 seats next to a guy (Rob) on the plane ( somehow sis. Chen, sis Tsoi and I sit separately on that plane). Being a missionary in the field for 6 weeks, I thought I must find a way to talk to him. However, he was reading a magazine and there was an empty seat between us. I started racking my brain to see what can I say and do that will take his attention. I didn't have much success despite keep looking over at him. I then decided I will stop being so creepy and make it natural. So I said a prayer to ask for the Lord to help me find an opportunity to talk to him. After the pray, I started writing in my journal and unintentionally fall asleep. When I woke up, there is still 15 minutes before we arrived. I looked out the window and saw a beautiful like below. I couldn't help and said out loud to the guy next to me: Oh wow, look how pretty this is! He turned and look out the window agreed with me. I took this chance to asked him his purpose to go to Seattle and find out a little about his family from the conversation. The conversation then leads to me able to tell him who I am and why I am going on a mission. I end up teaching him the restoration lesson. As I recited the first vision of Joseph Smith to him, I can felt the spirit so strong! I can see both light and questions in his eyes. I also told him my conversion story and how I came to find out the church is true and my testimony of Book of Mormon. As I invite him to read the B.O.M, he said: "from the way you talked about the book make me wanna to read it and find out more, so I will!" I couldn't express the joy in my heart. I was so grateful the Lord answered my prayer and provided a way for me to talk to him about the gospel. Nothing can be done without the Lord's help in the mission. I never know if he ended up contact the missionaries in his area (I gave him a mormon.org card and invite him to call for a book of mormon delivery) but I do know that he is a prepared person to have the gospel in his life. He has the desire to learn more. I sat with a couple of church members,the Gages, from Montana on the plane from Seattle to LA. Awesome family with strong testimony too! Before we got down from the plane, they gave each of us some money for our lunch at the airport. 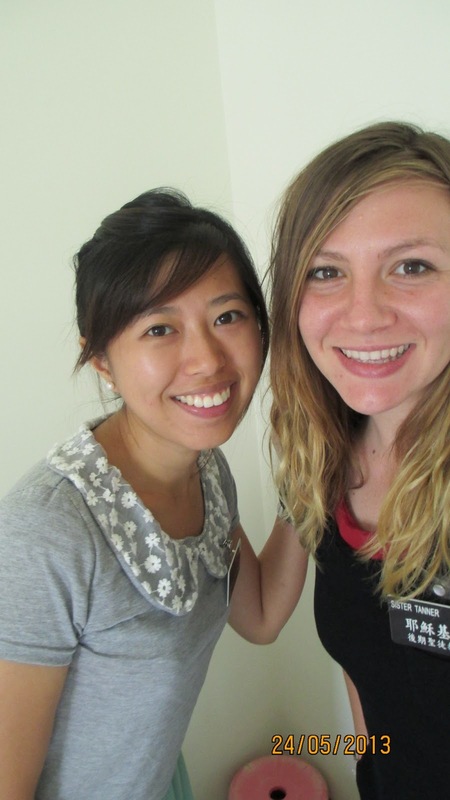 How grateful we are for good members like them to take care of missionaries. The works are going great. One of the investigators we teach was a mum with 2 kids, Li Jie Mei. She is just so humble and willing to learn. She and her son have a baptism date for next month. We are still trying to help them to come to church. They were supposed to come last Sunday but something happened at home so they didn't end up coming. I can feel that Satan is trying hard to get them away from church because he knows how ready they are. Makes me want to try harder to fortify my investigator. On Friday I went to Nan Zhi for an exchange with sister Tanner. She is such a humble person. I learnt so much from her about sacrifice our own pride to serve the Lord and our fellowmen (companion). She leads by example which make her a great leader. We are planning to go to Hou Zi San (Hill of Monkeys) to see some monkeys. Haha. Apparently is quite a popular place in Kaoshiung. Will get some pictures and share with you guys next week. PS: I have received a few letters from friends but sorry I haven't have time to reply yet. So please be patient with me. I will try to reply to 2 people each week. that's my P-day goal. I love letters so do write to me to update me what's new and happy about your life. Also, please write your return address so I can write to you too! Perona, thanks for the postcard. I love it. Still learning the aussie slangs on them. Haha. Michelle B and Brother.T Lawry,I got the lovely big combination notes from some members in Adelaide. Thank you so much!!! Richard R, and M Jensen, thanks for the letters to update me some fun things happen in your life.I enjoy reading them!